We humans are repetitive beings. As children, we learn by hearing the same stories. As students, we learn by reciting facts. And as adults, we habitually reiterate the same stories over and over again, often moving throughout our days in a sort of robotic hypnosis, repeating the same phrases to ourselves in our heads. While repeating a mathematical equation until memorized may benefit a student, repeating a negative story can create a self-­fulfilling prophecy. Focus on that time you got screwed last year, and before you know it, it’s happening again. Mantra meditation is, essentially, positive self-­hypnosis. Traditionally, it has been used for both prayers and affirmations. “OM,” is a traditional mantra that acknowledges all that is, without any form of judgement. “Lokah samastah sukhino bhavantu,” is a prayer mantra to bring peace to all beings. Another form of positive self-hypnosis is to focus on balancing the seven chakras — the body’s subtle energy system. I created the following chakra­-balancing mantras to help align your energy. Repeat each mantra alone, or in succession, aloud or silently. Observe how it affects your mind, body and spirit. To feel your connection to the earth, either sit with your feet or hips planted firmly on the floor; stand with your feet shoulder-width apart; or walk with your feet firmly on the ground. Envision a red orb at the base of your spine. Feel the energy at the base of your spine shift as you repeat the mantra. Envision a glowing orange ball at the lower abdominal area, the center of your creativity. Whether or not you believe you have artistic abilities, recognize you can open yourself to creativity. This can enhance myriad aspects of your life. As you repeat the mantra, feel the energy shift in the lower abdomen. Picture a golden orb spinning just above your navel or solar plexus, your power center. When this center is unbalanced, you might find yourself holding on to an idea, a relationship, or a position for dear life, caught up in “being right,” or lost in habitual emotional patterns and stories. Yet, as this mantra reminds us, sometimes letting go is the best solution. First, envision and honor whatever you’ve been grasping. It has served a purpose in your life. Now, allow it, and all it’s related stories, to float away. You have empowered yourself. Breathe into that feeling of empowerment. Feel the energy shift in your belly. Visualize a green orb at your sternum. The heart chakra is your center of love, giving and forgiving. Perhaps you were taught it is better to give than to receive. You could stand by a tree, inhaling and exhaling — you are participating in an equal exchange where both giving and receiving are required. With the inhalation, you receive the clean air that the tree filtered. With your exhalation, you give that same tree the carbon dioxide it needs to thrive. Breathe, repeat the mantra, and feel the energy shift in your chest. Envision a turquoise orb spinning at your throat. The fifth chakra is your center of communication. ­ Thoughts, words and even non-­verbal communication can originate in the throat chakra. This mantra reminds you that you have the power and the choice to plant beautiful ideas or nasty gossip. If you plant loving, kind, inspiring words, they will grow into the beautiful stories of your life. The sixth chakra, the wisdom center, is what guides you through your life. How often do you look for guidance but reject it because the ideas seem unfamiliar? Focus your internal gaze at an indigo orb spinning in the space between your eyebrows — your Third Eye. Inhale. Recite this mantra with each exhalation and feel the energy start to shift. How would it feel to try a new path, or to break an old habit or routine? The Crown Chakra is the energy center that connects you to the divine. Envision a violet orb spinning above the top of your head. Often confused with giving up or weakness, surrendering can actually be a sign of great wisdom and strength, and can bring tranquility. As you repeat this mantra, imagine how it might look to truly speak and act from a place of divine connection. What might you think, say and do differently, if you engaged the world from a benevolent perspective? Notice the energy shift at the crown of your head and hovering above the surface of your skin from head to toe. To finish, inhale and exhale very slowly and deeply through the nose. 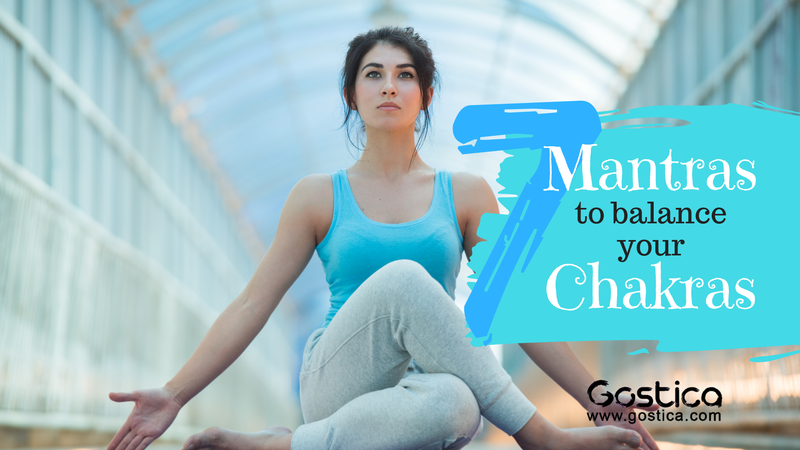 Acknowledge yourself for breaking routine, trying this new practice of mantra meditation, and inviting balance to your chakra system and your life. This was written by Rebekah L. Fraser for MindBodyGreen.